In the late 80s, I suffered from very bad migraine attacks which I accepted as genetic inheritance as some of my older siblings also suffered migraine attacks from around the same age as I. After suffering for a few years, I decided I was not going to succumb to this and to taking painkillers on each attack for the rest of my life. I discovered Chiropractic care in the early 90s, by chance. Since then I have not had any major migraine attacks. It was a revelation and the beginning of my journey into alternative health care. PS – I eventually moved to osteopathic care. In the mid 90s, I was told I have Chronic Fatigue Syndrome (CFS). However, that did not slowed me down as I am mentally strong and was able to still push myself to live a full and fast life in spite of my condition. I never believed in naps and rest. I just kept going and going — however, even the most powerful batteries in the world, if not recharged properly, the power will still eventually be diminished … and so it happened to me. I refused to take conventional medication and, I treated myself by learning and administering my own alternative medicine. This, I give credit to for my survival till today. Not until recently, there really was not much knowledge easily available on alternative health and medicine. In the early to mid 90s, during the pre-internet days, I had to manually read, research and dig to find out about alternative health and medicine. Even in those days, I have personally come across people who have fought and won over illnesses which conventional medicine had given up on. These real live cases strengthened my believe in alternative healthcare. Even feeding all the nutrients, the body must still rest and be given the chance to absorb all these nutrients from supplements as well as from food. I did not believe in rest and did not provide my body the correct environment to absorb these nutrients/supplements I was taking. Yes, the supplements helped me to be where I am today but IF I had helped my body to absorb these nutrients better, I would be a healthier individual today than just “sustaining my survival”. I believe these supplements plus the natural healing modalities are the reasons I am healthier today for someone my age – as I do not have all the typical age-old issues such as high cholesterol, high blood pressure, diabetes (I have strong genes for Type II), etc. But I continued to suffer from Chronic Fatigue Syndrome. My fatigue body finally could take no more. I didn’t collapsed totally but I was left with signs that my body was crying out “no more, please” — which I thankfully (eventually) took notice of. I developed a lump on my thyroid glands a couple of years ago and, I treated that with natural medicine and the lump disappeared. I was also eventually diagnosed with Fibromyalgia — similar to Chronic Fatigue Syndrome but I had constant joint pains (24 x 7). An eventual test — testing at cellular level- showed that for reasons unknown, I was not able to absorb Vitamin B and Protein needed for biological oxidation (the making of energy). As I understand it, the body absorbs nutrients (from food and the supplements) to do 2 things. One, to use the nutrients to re-build the tissues for growth and repair. Two, to use some of the nutrients to make energy so that we can think, move, etc. My body could do one but not two. Hence, while I am healthy with no age-old health issues but I am constantly tired to the extent that 2 years ago I could not even think properly. I had problems forming even a thought – and that frightened me. I thought I was on the verge of Alzheimer’s. I also suffered from chest pains and as I understand it, this is due to my heart over-working to compensate for the lack of energy production by (over?) pumping oxygen to the cells – oxygen being one of the ingredients for energy making. Another possible effect of the ‘over-worked’ heart is water retention in my hands and feet which gets swollen over night — painful enough to keep me awake at night. I passionately believe in Preventative Medicine. Prevention is likely to be less costly for a lot of critical illnesses. More importantly it is less stressful emotionally and financially than trying to cure an illness. Preventative medicine will also give us a better chance at a quality life. While many people would strive for a long life, I would do all I can to live a quality life and if it’s long, a great bonus. The truth of the matter is I think we don’t have a say in the length of our life. There is a Chinese saying that birth and death are pre-determined. If so, I can’t control that. However, I can definitely take definitive actions to create the quality of life that I wish to have. In that spirit, I kindly invite you to explore this website and my upcoming articles and blogs. …. and hopefully in doing so, you too will discover ways to live a more naturally and healthy lifestyle. 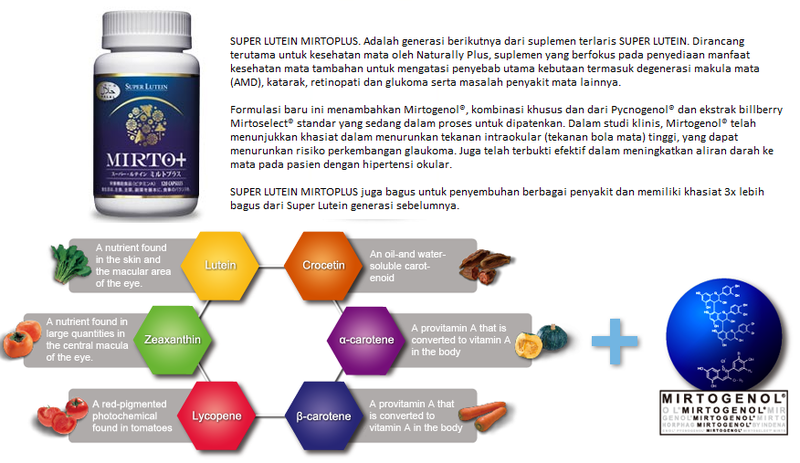 Untuk Memperbaiki Kesehatan Tubuh Secara Menyeluruh ini bisa dengan konsumsi S.LUTENA atau biasa kita sebut Super Lutein.